Recently, my brother went to Vancouver for the World Cup, where he watched Canada beat Switzerland and England beat Canada. To keep costs down, he camped on the edge of the city, spending one night in his car and taking a “bath” in a lake. I’m not that kind of camper. But I don’t need the full-on glamping experience, either, with a personal chef tossing my lime-cilantro cabbage slaw outside my teak-furnished yurt. 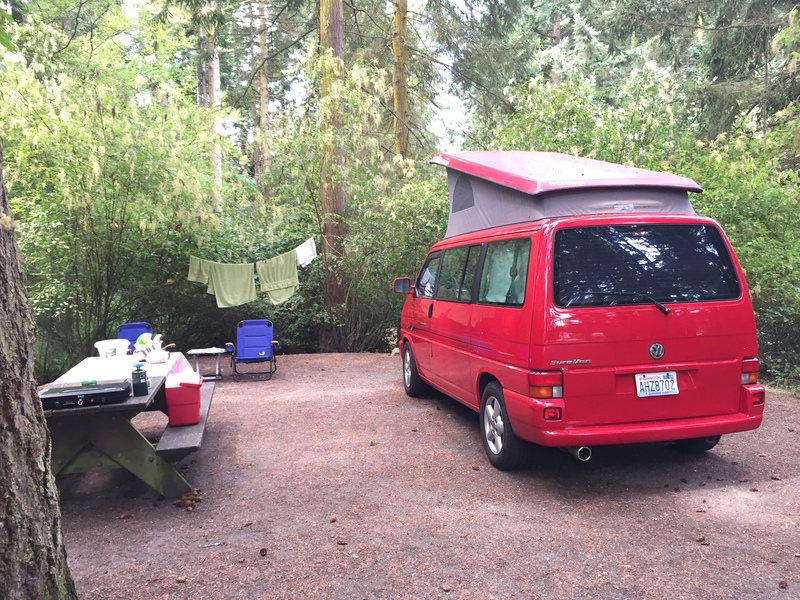 For me, a Eurovan Weekender parked in the forest of Fort Worden during the Port Townsend Writers’ Conference is the perfect blend – call it cultured camping. Arline got the urge to buy a Eurovan last summer, and after a series of conversations in which I attempted to keep my mind open (“You want to do what?”), we found a 2003, cherry red Weekender on Craigslist, and this summer we have had our first opportunities, not counting one night last fall, to camp in it. Unfortunately, the first planned excursion – my birthday weekend in Prosser, Washington, at the Wine Country RV Park – had to be cancelled due to temperatures forecast in the three digits. No amount of wine tasting at Vintner’s Village next door to the camp site was going to distract me from 111 degrees; I would have wilted in a dehydrated haze. Instead, we spent our first two nights in the van at Moran State Park on Orcas Island. It’s painful to confess how distressed I was to find, upon dropping into my camp chair after we arrived, that not only did we have no LTE internet access in the park, but no cellphone service at all. What’s camping without checking my email and posting photos on Facebook? But I did swim every day in the lake, and Arline was able to test her bin organization strategy. The bonus was chocolate muffins at Brown Bear Baking in Eastsound. About a week later, we drove to Port Townsend, set up our camp site at Fort Worden, and settled in for five days of the writers’ conference. Now, this is my kind of camping: a lodge with tables and Internet access for rainy mornings; writer friends dropping by the camp site in the afternoons for glasses of wine; dinner with Nyla Dartt and Marcia Perlstein of KPTZ radio, who had interviewed me a few weeks before; readings by Pam Houston and Luis Urrea in the evenings. We walked to Pane D’Amore in Port Townsend for bread and drank beer at Sirens, overlooking the Sound. Not really “getting away from it all.” More like: eating, drinking, hanging out with cool people, and taking a walk on a beautiful beach. Our next camping trips are in August: Mount Rainier and the Oregon Coast. No guarantee I’ll be able to check Facebook from the Mount Rainier campground. But it looks like we can walk from our beach camp site to Manzanita, Oregon, which I know has a wine bar. Salud! This entry was posted in Travel, Writers and tagged travel, writing. Bookmark the permalink.